RRB Secunderabad Recruitment 2018 : Good News Aspirants !!! Here is the one more opportunity came from Railway Recruitment Board Secunderabad for candidates who are looking for settle in Central Govt Jobs. Recently Central Government has issued RRB Secunderabad Group D notification 2018. This notification is regarding to fill up 6523 Posts for Group D. So, Don’t miss the chance to enter into the Central Govt job Sector. This is the right time to fill up Central Group D Application form. The candidates who are eligible for this RRB Secunderabad Group D Jobs 2018 can apply through the official website. RRB Secunderabad Recruitment 2018-19 – Apply through Online for 6523 vacancies of Group D posts: Railway Recruitment Board Secunderabad recently released a job notification on its official website rrbsecunderabad.nic.in for Group D posts. 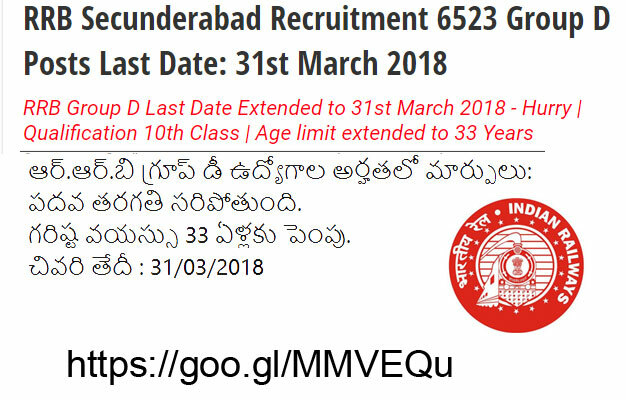 Candidates are allowed to apply for RRB Secunderabad Recruitment 2018 from 10/02/2018 to 31/03/2018. Candidate can find the further details like Eligibility Criteria, Age limit, the Selection process of RRB Secunderabad Recruitment 2018 on the below page. Job Seekers can apply for the post through the Official page rrbsecunderabad.nic.in and www.careers99.com. Interested Job Aspirants who are ready to apply for Railway Recruitment Board Secunderabad 2018 Notification must possess the below-given Eligibility Details. “10th pass (OR) ITI from institutions recognized by NCVT/SCVT (or) equivalent (OR) National Apprenticeship Certificate (NAC) granted by NCVT”. SC/ST For all Community / Categories Candidates belonging to community/categories in the table at para 5.1 shall be eligible for age relaxation as applicable. Note: The date of birth limits for SC/ST & OBC-NCL given in this table includes community age relaxation. Rs. 18,000/- along with other allowances. * Out of this fee of ₹ 500, an amount of ₹ 400 shall be refunded duly deducting bank charges, on appearing in the CBT. For Candidates belonging to SC / ST / Ex-Serviceman / PWDs / Female / Transgender / Minorities / Economic Backward Class. ** This fee of ₹ 250 shall be refunded duly deducting bank charges, on appearing in the CBT. 1. Open Official Website i.e., rrbsecunderabad.nic.in or Below Mentioned link from www.careers99.com Website. Dear candidates, After you successfully applied for the Group D posts, Get ready to study hard. Because RRB Secunderabad Jobs have heavy competition. And we are here to provide the syllabus of RRB Secunderabad Group D recruitment. We Provide Updated Latest syllabus of RRB Secunderabad Group D Written Test to be held soon. So Download the Latest Syllabus for Group D Written Test from below link. RRB Secunderabad Group D Recruitment Previous Papers | RRB Secunderabad Group D Posts Previous Exam Question Papers are uploaded here for the applicants those who have applied for Railway Recruitment Board Secunderabad Recruitment 2018. Job seekers who are going to prepare for the RRB Secunderabad Group D Exam 2018 can download the RRB Secunderabad Group D Syllabus & Exam Pattern in a pdf format for Free of Cost from www.careers99.com. Railway Recruitment Board Secunderabad Previous Papers Free Download | RRB Secunderabad Group D Exam Previous Papers with Answers are available here in www.careers99.com to download for free of cost. Here on this website www.careers99.com, we have provided RRB Secunderabad Group D Previous Papers in PDF Format and easy to download. RRB Secunderabad Group D Model Papers are available in the PDF format. To get the good score and also beat the competitors score in the written examination these papers will help you to crack the vacancy. www.careers99.com Team has updated the free download links in the below section of this page. The subject wise previous papers for Group D exam are available on this page. By practicing the model papers aspirants will be able to get the good score in the written examination.